While the use of social media by firms is nearly ubiquitous, there has been little analysis of its effectiveness in helping small businesses succeed in a highly competitive market. 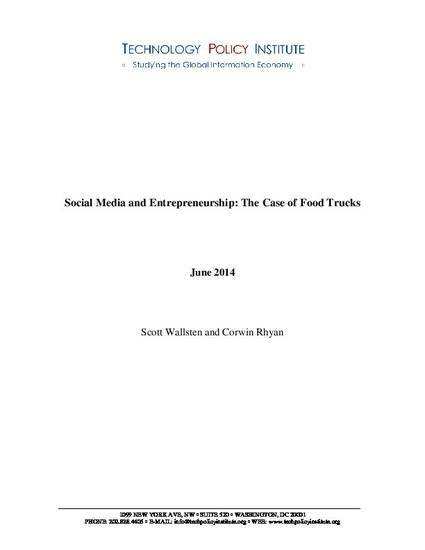 To begin studying this question, we created an extensive dataset on over 250 mobile food trucks—a dynamic, somewhat homogenous, and low-entry cost business that is highly dependent on social media for its business model—which operated in the Washington, DC metro area from 2009 to 2013. We explore how their use of social media and Internet services like Twitter, Facebook, and business webpages effect their ability to stay in business. We find that trucks with a Facebook page and website have a higher likelihood of staying in business longer, and trucks that send around two tweets a day are more likely to stay in business than those who send fewer. Trucks tweeting more than twice a day, however, do not show an increase in longevity. Additionally, the number of reviews a truck receives—almost certainly an indicator of demand—is correlated with its ability to stay in business but the average review score itself is not correlated with a truck’s likelihood of staying open.